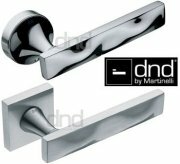 Luxury door handles taylor made in Italy by Manital, Martinelli and Rosso Maniglie. Hydra Italian door lever handles on a 50mm x 8mm sprung round rose, cast in zinc alloy, fixing included. Lever length 126mm, projection 60mm. 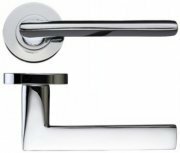 Available in Polished Chrome & Satin Chrome, Black & E-Bronze. Pavo Italian door lever handles on a 50mm x 8mm sprung round rose, cast in zinc alloy, fixing included. Lever length 117mm, projection 60mm. Cygnus Italian door lever handles on a 50mm x 8mm sprung round rose, cast in zinc alloy, fixing included. Lever length 120mm, projection 66mm. 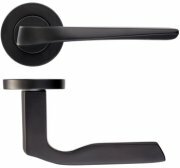 Mensa Italian door lever handles on a 50mm x 8mm sprung round rose, cast in zinc alloy, fixing included. Lever length 118mm, projection 58mm. 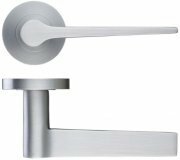 Aries Italian door lever handles on a 50mm x 8mm sprung round rose, cast in zinc alloy, fixing included. Lever length 128mm, projection 60mm. Corvus Italian door lever handles on a 50mm x 8mm sprung round rose, cast in zinc alloy, fixing included. Lever length 115mm, projection 65mm. Lyra Italian door lever handles on a 50mm x 8mm sprung round rose, cast in zinc alloy, fixing included. Lever length 120mm, projection 68mm. Barletta door lever handles on a 50mm x 8mm sprung round rose, cast in solid brass, fixing included. Lever length 115mm, projection 60mm. Italian inspired design by DA-T Maniglie. Vitorria door lever handles on a 50mm x 8mm sprung round rose, cast in solid brass, fixing included. Lever length 125mm, projection 60mm. Imola door lever handles on a 50mm x 8mm sprung round rose, cast in solid brass, fixing included. Lever length 112mm, projection 58mm. 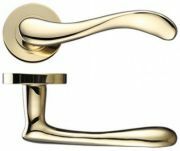 DND Luxury Italian door lever handles on a 52mm sprung round rose or square rose, cast in solid brass, fixing included. Lever length 130mm, projection 66mm. Made in Italy by Martinelli, designed by Mauro Ronchi. 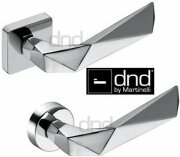 DND Spike Italian door lever handles on a 52mm sprung round rose or square rose, cast in solid brass, fixing included. Lever length 140mm, projection 72mm. Made in Italy by Martinelli, designed by Karim Rashid (Time magazine has described him as the "most famous industrial designer in all the Americas"). 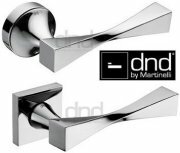 DND Twist Italian door lever handles on a 52mm sprung round rose or square rose, cast in solid brass, fixing included. Lever length 130mm, projection 63mm. Made in Italy by Martinelli, designed by Karim Rashid. (Time magazine has described him as the "most famous industrial designer in all the Americas"). DND Grip Italian door lever handles on a 50mm sprung round rose, cast in solid brass, fixing included. Lever length 125mm, projection 67mm. Made in Italy by Martinelli. DND Link Italian door lever handles on a 50mm sprung round rose, cast in solid brass, fixing included. Lever length 128mm, projection 58mm.